It’s only been a solid two weeks into school and some are already getting grades back. Derick “Ringo” Adamson isn’t one to hand out participation trophies or be unrealistic with his teams. He’s more of an architect, wanting to go into every detail of every meet and see where to improve come not only for the next competition, but for the practices that will come before it. Not harsh in with the way he formats his grading scale and expectations, Adamson is a coach that wants all of his team’s to find their true potential. That’s why he gave his Rowan women’s track and field team a B- on their first meet back from break in mid-January. Some rust had been shaken off by the time the team headed to Ithaca College this past weekend for the Bomber Invitational. So much so that the team’s grade improved ever so slightly. “[I’d give them a] Solid B,” Adamson said. But hence the second word two paragraphs ago. Not all of that rust has been removed. But where some aspects of the team might be a bit behind compared to earlier in the season or even last, others are showing out. 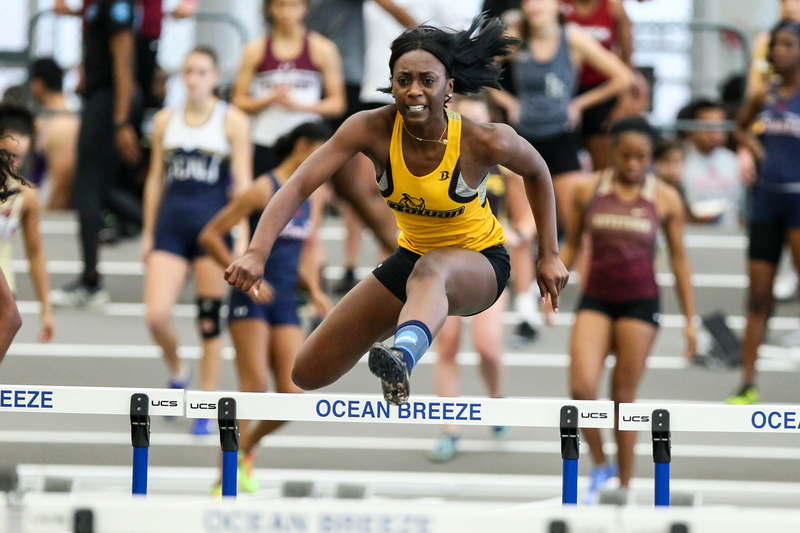 That recruiting has clearly showed this year, as sophomore Olivia Scattergood broke a Rowan school record with a distance of 45′ 8.50″ in the weight throw at the Moravian Invitational. Freshman Makayla Taylor has been exceptional in the shot put as well, posting a season-best 41’ 5” at the Ithaca Bomber Invitational. And it just got a bit better early Tuesday afternoon. Coming up, Ringo will have some members of the team head to Boston for two days at the David Hemery Valentine Invitational and others going to the FastTrack National Invitational for a day meet on Friday due to conditions for certain events and getting extra work in for those on the cusp of NCAA qualifications. Junior Hannah Vendetta will run the mile on Friday night in Boston because Adamson believes she can hit a time of under five minutes and it can get her warmed up for Saturday. Vendetta’s best mile time is 5:07.66 that she set last year at the All-Atlantic Region Conference Championships. Her current best this season is 5:14.29. The chance to have some warm up and attempt to have better times, just as he is doing with his best mile-runner, before competition on Saturday afternoon, is a no-brainer to Adamson. Now with all of Adamson’s ideologies set into place, the next thing for the team to do is to just perform at their respective places this upcoming weekend.